Pictured are students from Hannan Jr. / Sr. High School. 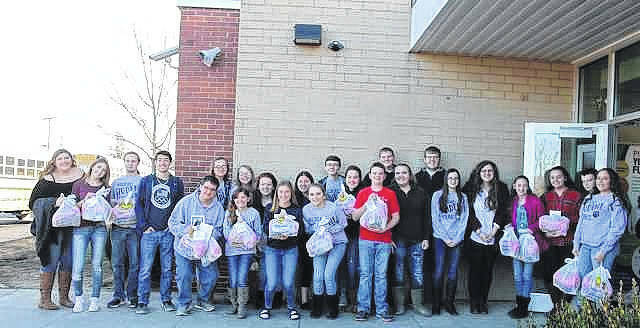 The school recently started a “Spread the Love” program aimed at combating hunger in local communities. ASHTON — This week Hannan Jr. / Sr. High School students made an effort to spread holiday cheer, literally. “Spread the Love” is a program aimed at combating hunger in local communities. The project works by providing a loaf of bread, a jar of peanut butter, and a jar of jelly to every single student enrolled at Hannan High School, regardless of financial status. The inspiration for this project began when Hannan’s own principal, Dr. Karen Oldham, witnessed the project taking place in high schools across the southern United States. School administration also acknowledged allergy and dietary needs when considering the project so every student could be included. Now every student had something to look forward to this holiday season. Hannan High School would also like to give special thanks to the following for making the program possible this year: Heiner’s bakery, Donna and Stewart Duke, and Charlie Forth from Forth Foods. Hannan would also like to provide special recognition to the Student Council for picking up the supplies, packaging the items, and passing out the items. Finally, Hannah would like to give thanks to the Robert and Louise Claflin Foundation. This foundation was organized in 2009 for the benefit of local students, organizations, and other efforts in Mason County. The Robert and Louise Claflin Foundation provided efforts in making the Spread the Love program possible this year, and for that Hannan would like to provide special thanks. https://www.mydailyregister.com/wp-content/uploads/sites/24/2017/12/web1_12.23-Hannan.jpgPictured are students from Hannan Jr. / Sr. High School. The school recently started a “Spread the Love” program aimed at combating hunger in local communities. This story submitted by the Hannan High School Student Council.